All the stats and facts from the forty ninth match of IPL 2018 between Kolkata Knight Riders and Rajasthan Royals. 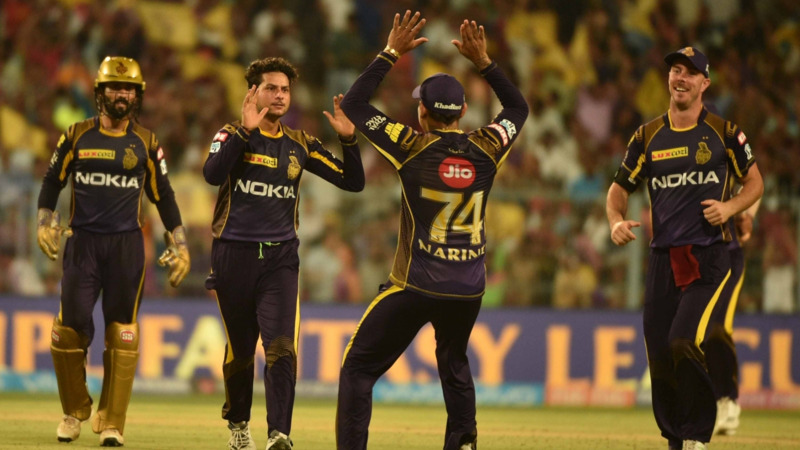 Kolkata Knight Riders jumped to third place in the standings with a thumping 6 wickets win over Rajasthan Royals at the Eden Gardens in Kolkata. And now, Knight Riders have seven wins from thirteen games of IPL 2018 campaign and need to win the last match to qualify for the playoffs. On the other hand, Rajasthan Royals are almost out from the competition after this loss. Rajasthan Royals openers Jos Buttler and Rahul Tripathi gave a brisk start to their team as the duo added 63 runs in the first 5 overs, but after that, left arm wrist spinner Kuldeep Yadav pulled things back for his team by picking 4 wickets and Kolkata Knight Riders bundled Rajasthan Royals out for just 142 runs and chased down the target in 18 overs. 4 - Four dismissals for Dinesh Karthik - the most for any wicketkeeper in a game in IPL 2018. 4/20 - Best bowling figures for Kuldeep Yadav in the IPL and overall his second best bowling figures in T20 cricket. 4/20 - Kuldeep Yadav's bowling figures of 4/20 are also the best bowling figures by a chinaman spinner (left arm wrist spinner) in the IPL. The previous best was 4/29 by Brad Hogg against CSK at Eden Gardens, Kolkata in IPL 2015. 5 - This was Kolkata Knight Riders' fifth win over Rajasthan Royals at the Eden Gardens, Kolkata in six matches and haven't lost a game to Royals at this venue since IPL 2008. 28 - Jos Buttler scored 28 runs in an over - the joint most runs scored in an over in IPL 2018. Shreyas Iyer also scored 28 runs and on both the occasions, the bowler was Shivam Mavi. 107 - Jos Buttler's batting average while opening in IPL 2018 - the highest for an opening batsman. Buttler scored 428 runs at an average of 107 and at a strike rate of 165.89 in 6 innings with 5 fifties in the opening. 186 - Dinesh Karthik's batting average in successful run chases in IPL 2018. His scores read 41*, 45*, 23, 42*, 35*.